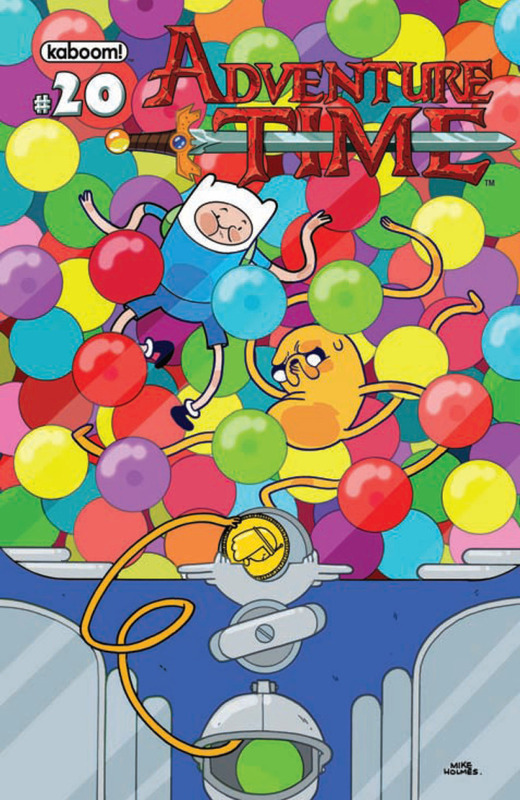 My ADVENTURE TIME Story “Grocery Time” is out this Week! Comments Off on My ADVENTURE TIME Story “Grocery Time” is out this Week! Glob be praised! I have ANOTHER comic book story out this month, following up my tale in REGULAR SHOW #3 with “Grocery Time” in ADVENTURE TIME #20! You can advance-order it on comiXology here in e-form, or from KaBOOM!’s website. Here are some fun facts about this tale! 1) It was written nearly a year before “Sombrero World,” my REGULAR SHOW story, but got held up because KaBOOM! didn’t know Cartoon Network had approved it already. 2) It was one of 10 pitches I made to KaBOOM! for ADVENTURE TIME stories. Coincidentally, it was also the pitch I had developed the least. 3) The pitch was, “in a tale told in hard-rock narration, Billy goes to the Grocery Kingdom to get stuff for a party, but finds himself pitted against the Notorious Ham-Pire and his Avocadobots.” I had no idea who the Ham-Pire and the Avocadobots were when I pitched that. They were just weird names I’d written down in my file of ideas that sounded like ADVENTURE TIME characters. 4) When writing the script, I had to come up with a quick way of explaining the Ham-Pire. 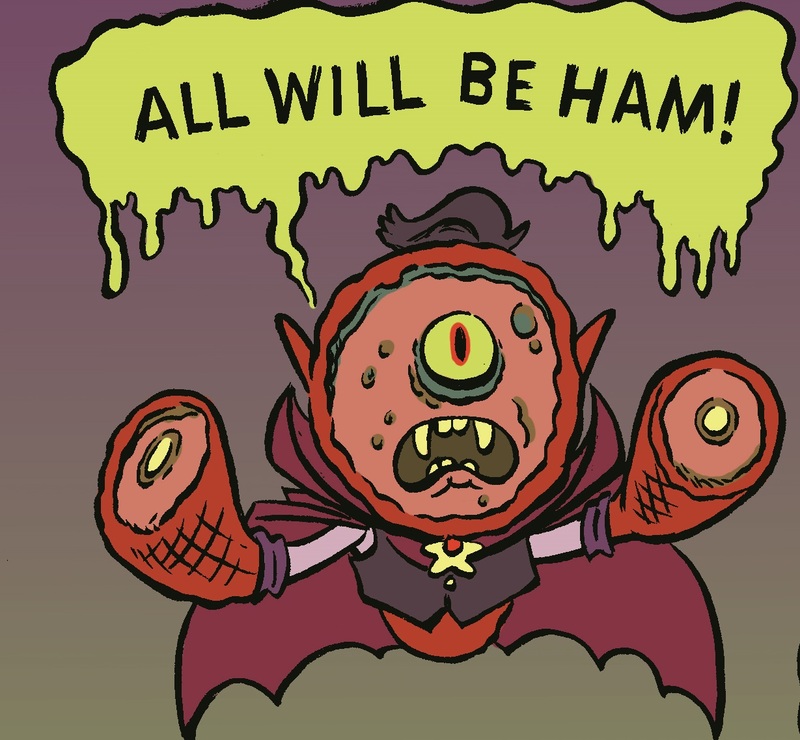 After debating whether he should be an adorable pig with fangs and a Dracula cape, I hit on a very quick explanation: AN EXPIRED HAM BACK FROM THE GRAVE. BIOGRAPHY: The Notorious Ham-Pire was once a delicious glazed ham in the Grocery Kingdom, who due to poor shelving and a ham surplus, found itself freezer-burned and moldy. Tossed away with other expired foods, the ham was accidentally exposed to a faulty, non-functioning batch of Candy Kingdom serum that was mistakenly thrown in the same bin. The molds and glaze mutated the serum, causing it to reanimate the ham as an undead creature of PURE EVIL. The Ham-Pire discovered that it needed to drain sugars and artificial preservatives from other creatures in Ooo in order to survive. Hence, it regularly haunted the remote aisles of the Grocery Kingdom, sustaining itself on various snack products and food-beings unfortunate enough to cross its path. Members of the Candy Kingdom were particularly in peril from the creature; its cloven (well, clove) teeth could drain the Candy Life from their bodies, reducing them to non-living-but-still-delicious consumables, though they had been on the ground and you probably shouldn’t touch them. In one of its most fiendish moves, it resurrected an army of dud avocados with cyber-parts to create “Avacadobots” it used in an attempt to conquer the Grocery Kingdom’s Ice Cream Peninsula. Its ploy would have succeeded had the hero Billy not needed to pick up some ice cream for a party, and even then the great legend nearly got mad-walloped until he used a robo-controller toy from a box of cereal to turn the Ham-Pire’s Avacadobots against it. The current whereabouts of the Ham-Pire are unknown, though there are rumors that it is entombed somewhere in a remote area of the Candy Kingdom, withered but still “alive.” Should it ever escape, the Land of Ooo would be in great danger, as they will never see it coming…though they will smell it. Hoo boy, will they smell it. POWERS/ABILITIES: Aside from being a technical genius on the level of Princess Bubblegum, the Ham-Pire can hover/fly (necessary as it lacks feet), possesses enough strength to let it throw down on Billy in his prime, possesses incapacitating “Clove-Breath” and can drain the life force from most artificially-animated food products. Non-food-beings bitten by the Ham-Pire are vulnerable to the food poisoning contained in its fangs, and might possibly turn into hams themselves, though that might just be something someone said on the Internet somewhere. AFFILIATIONS: The Ham-Pire has been known to use a number of hench-things, usually made from rotting, expired food fused with robot parts to make them CYBORG FOOD ZOMBIES. It also had a self-declared “Ham Kingdom” consisting of a number of spiral-cut hams it “liberated” from the Grocery Kingdom, but was oblivious to the fact that none of them could actually move/speak/do anything other than sit there being ham. ENEMIES: Pretty much everything food-related in Ooo is food for the Ham-Pire. It resents most non-food organic beings for not being made of ham, and regards them as “Wrong-Meat” enemies. It’d be pretty much indifferent to BMO. There are also rumors that the Ham-Pire could be destroyed forever by a steak through its heart. That is not a misspelling. NOTE THE FIRST: The Ham-Pire is not a vampire, it is a ham-pire. It’s different from a vampire the way a Why-Wolf is different from a Werewolf or a Hug Wolf. A lot of people make that mistake. There were rumors that it once tried to declare itself the Vampire King to Marceline, but that didn’t end well for it. NOTE THE SECOND: It is also rumored that in its pre-ham state, the Ham-Pire was an ancestor of Mr. Pig. It was not. That’s just based on the ignorant belief that all pigs know each other. Do all humans know each other? Don’t think so. Don’t you feel bad now? NOTE THE THIRD: To clear up any additional rumors: No, it was not the father of Gunter’s kitten. They may have dated briefly, but that’s none of our business. So, you know, you can use that for your fanfic or whatever. ADDITIONAL NOTES: Brad McGinty and I came up excuses for about two dozen cameos by ADVENTURE TIME characters and items in this story. Some of these make no sense in the chronology of the series, but it’s an out-of-continuity comic book and for fun, so shut up. We are trying to pitch some more stories, including ideas for a miniseries about Billy and some other AT characters, including Lemongrab, Joshua and Lumpy Space Princess. If anything happens, we’ll let you know, but bugging KaBOOM! or whatever might be something. Anyway: GROCERY TIME! Out Wednesday! I have absolutely no projects to follow this up with, but wait a year. In the meantime, check out my insanely extensive ADVENTURE TIME art collection! I just added pieces by BONE’s Jeff Smith, PALOOKAVILLE’s Seth, and many many others!